Home » Naomi Watts Strolls With Her Giggly Guys! 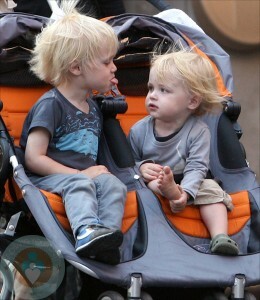 Naomi Watts enjoyed a stroll with her 2 happy boys Alexander ‘Sasha’ and Samuel “Sammy” in NYC yesterday. The boys spent most of the walk laughing and playing with each other until Sammy pinched Sasha, to which he stuck his tongue out at him. At some point in the walk Sammy has also lost a croc. Let’s hope mom noticed. We’ve lost a few on walks. Naomi pushes a Baby Jogger City Mini Double Stroller.